This page Wise fool is part of the foolishness series. The wise fool, or the wisdom of the fool is a theme that seems to contradict itself in which the fool may have an attribute of wisdom. With probable beginnings early in the civilizing process, the concept developed during the Middle Ages when there was a rise of "civilizing" factors (such as the advent of certain practices of manners in Western Europe) and achieved its most pronounced state in the Renaissance. The wisdom of the fool occupies a place in opposition to that of learned knowledge. innocence of the heart (simpleton). Innocuous fools have often enjoyed special privileges in cultural and economic groups, whereas aggressive madmen had to been restrained or incarcerated. A fool's powerlessness and helplessness may gain them protection of more fortunate people. Since the fool is only guided by their natural instincts, because they do not understand social conventions, they are not culpable for breaches of those rules. The fool is not expected to "know better" or "know" anything. Because of this, the fool has often been given great relative freedom, particularly in speech. The advantage of speaking with exemption from punishment has made the fool attractive in the literary imagination, for example, the fool in Shakespeare's King Lear. Lear's fool is one of only three people in the play who consistently speak to him wisely, and the other two, Cordelia and the Earl of Kent, are punished severely. Though the fool is in a position separated from normal society which can cause them to be subjected to deriding acts and contemptuous treatment, it has also at times caused them to be regarded with respect and reverence — the holy fool. 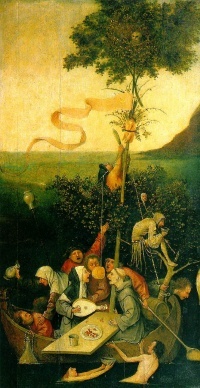 In the Middle Ages, and in some primitive societies, the fool was thought to be under the protection of God and possessing "Godly imparted tongues". Feast of Fools and the "Merry Company"
Unless indicated otherwise, the text in this article is either based on Wikipedia article "Wise fool" or another language Wikipedia page thereof used under the terms of the GNU Free Documentation License; or on original research by Jahsonic and friends. See Art and Popular Culture's copyright notice. This page was last modified 13:29, 19 February 2014.